Since launching the Projects interface last month, our team has been busy implementing a series of new features to improve your team’s productivity and overall map accuracy in 2019. 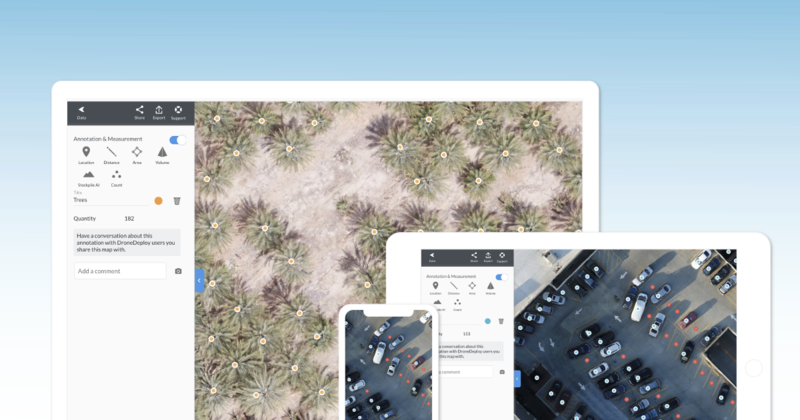 Read on to learn more about new automated flight settings, map alignment capabilities, Autodesk export options, and a suite of AI tools now available to DroneDeploy customers. The Joy of aligned maps in action over the course of a project. Align Maps Over Time — Instantly. Comparing maps over time is one of the most common uses of DroneDeploy. But comparing the same areas can be tricky if the maps don’t line up. Unfortunately, GPS accuracy varies and maps of the same location can shift anywhere between 5–10 meters without the use of ground control points (GCPs). To overcome this problem, we built a new solution into our proprietary Map Engine to align new maps with those previously made at the same location. As an added benefit, the absolute accuracy and scale of a map made with GCPs will improve the accuracy of future maps in the same area — meaning you can map more often with less effort and still get great results. Use map alignment in conjunction with the “Side-by-Side” app, to see how things have changed on your site. Automatic Map Alignment is now available to all paying DroneDeploy customers. Have you ever had trouble finding the annotation or measurement that you’re looking for in a map with dozens or even hundreds of annotations? Or perhaps you’ve wanted to hide specific annotations and focus on those that are most important? New improvements to DroneDeploy annotations make both of these tasks possible. Now you can view a list of all of the annotations on your map. You can then select or hide specific annotations, and you can even use the search and filter tools to look for specific annotations or annotation types. Filter annotations by measurement type using the filter icon on the dashboard. For those times when absolute accuracy is required, efficient use of GCPs and checkpoints for mapping is extremely important. For the last six months, thanks to thousands of DroneDeploy customers tagging GCPs, we’ve trained our machine learning algorithms to automatically identify and geolocate the most popular types of GCP markers automatically. If some, or all of your GCPs are automatically identified, you’ll get a notification in the typical email workflow. You will notice that many of your GCPs are already tagged when you open the link. Ground Control AI will continue to improve as you use it, and will learn from your corrections over time. Once GCPs have been detected, you can finish selecting any additional GCPs that may be in the map. Ground Control AI is now available to all Business and Enterprise customers. We launched our Counting tool last August. Since then, customers have annotated more than 360,000 objects. Uses include auditing solar panels, asset quantification, damage assessments, crop yield estimation, and more. With a significant amount of counting data under our belts, our team can now rapidly train our counting algorithms to detect and count custom objects for our enterprise customers. Select an area and Count AI does the rest. The first two object types we are supporting are cars and trees, but if your workflow requires counting any object series in your maps, sign up for our beta program today and contact your DroneDeploy Account Manager to learn more about this new feature. Stockpile AI detects stockpiles, saving time when measuring volumes. Measuring stockpiles on construction sites, mines, and quarries is one of the most common use of DroneDeploy’s measurement tools. To speed up the stockpile measurement workflow, we developed our Stockpile AI assistant to annotate and measure stockpile volumes with a single click. When you select the Stockpile AI icon, DroneDeploy will detect and highlight all stockpiles present on your map. You can then generate an instant volume measurement by selecting the stockpile you wish to measure. It’s that easy. Stockpile AI is now available to all Enterprise customers. Our construction customers have frequently asked to import drone-generated point clouds from DroneDeploy to AutoDesk Civil 3D, Revit, and Navisworks. We’re happy to announce this capability is now available in DroneDeploy. To directly import your point cloud files to AutoDesk, choose the AutoDesk (.rcp) format when you export your next point cloud. The .rcp data will also include a .rcs point cloud as well. These new point cloud formats can be exported using all the local and custom coordinate systems we support for existing exports. RCP exports are available to all of our Enterprise customers.